Over 300 b/w photographs, 200 pages, hard cover. 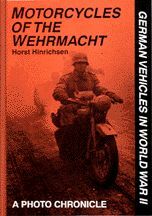 The book documents the riders and motorcycles of the Wehrmacht in great variety, and in all theatres. It includes many rare photos of requisitioned machinery including Terrot and Gnome et Rhone, and information on the uses to which captured allied motorcycles were put. 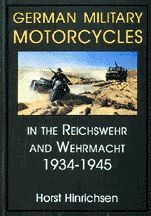 There is information on the allied parachute troop's bikes - the Cushman and Welbike - in addition to the better known Allied machines such as Norton, FN, Indian, HD, BSA etc. The book is of great interest to the motorcycle historian, and a fascinating read for all enthusiasts. 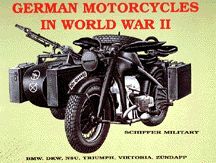 Covers BMW, Zundapp, NSU, DKW sidecar motorcycles on a variety of war fronts. Includes over 100 original b/w photos.